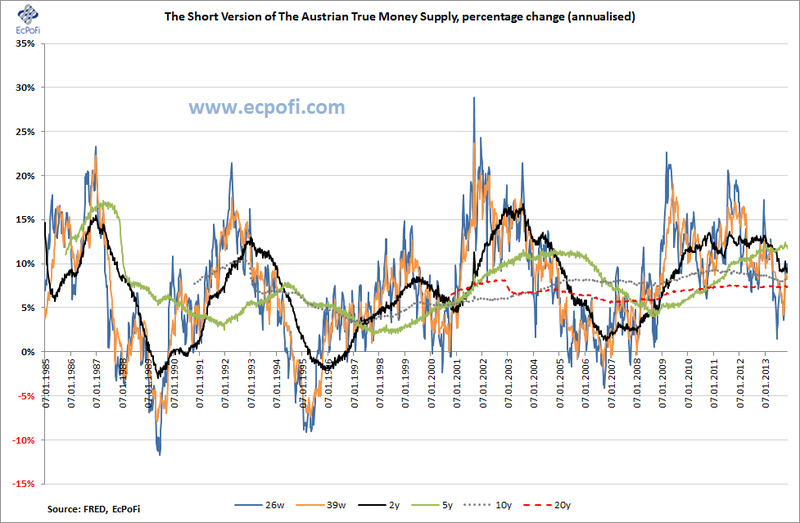 The short version of the Austrian True Money Supply (SVTMS) for the U.S. decreased by 0.43% (20.26% annualised) during the most recent week ending 25 November to reach USD 9.7190 trillion calculated based on monetary statistics just released by FRED. 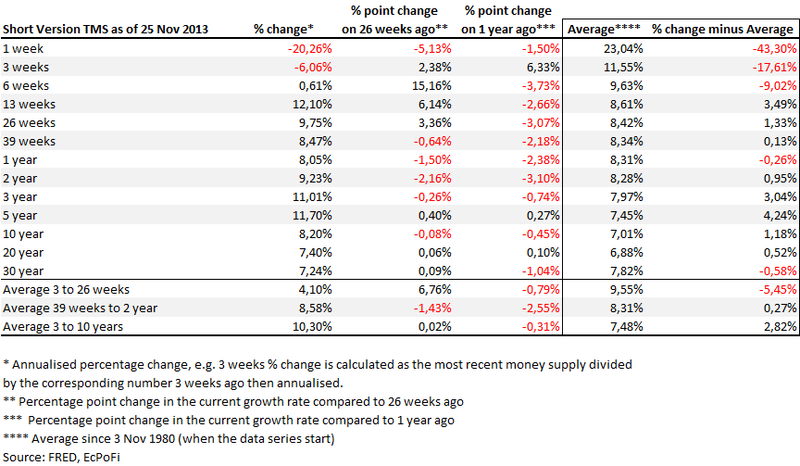 The 1-year growth rate in the money supply declined slightly from last week, from 8.09% to 8.05%. The growth rate was 1.50 percentage point lower than 26 weeks ago and 2.38 percentage points lower than a year ago. 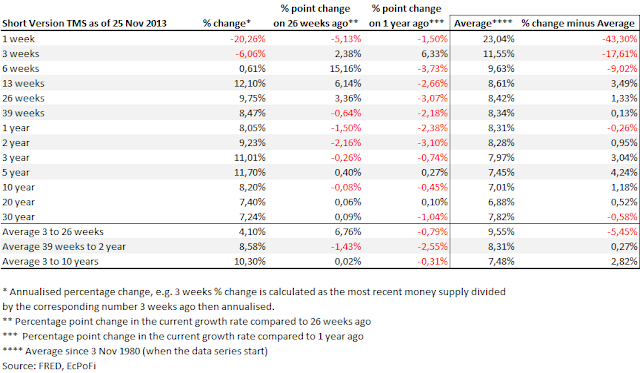 As the first chart below shows, the 1-year growth rate has been declining for most of this year. Long term followers of the stock market and students and theorists of the business cycle have long discovered that both the economy and the stock market fluctuates. In the early 20th century, Nikolai Kondratiev proposed that "Western capitalist economies have long term (50 to 60 years) cycles of boom followed by depression". Since I began carefully watching the stock market back in 1995, there can be little doubt, even if Kondratiev was (is) right, that there exists major boom and bust cycles which are much, much shorter. I am of course talking about the bear markets (busts) in 2000 to 2003 and 2007 to 2009 (approximately) judging by the ups and down in the S&P 500 stock market index. 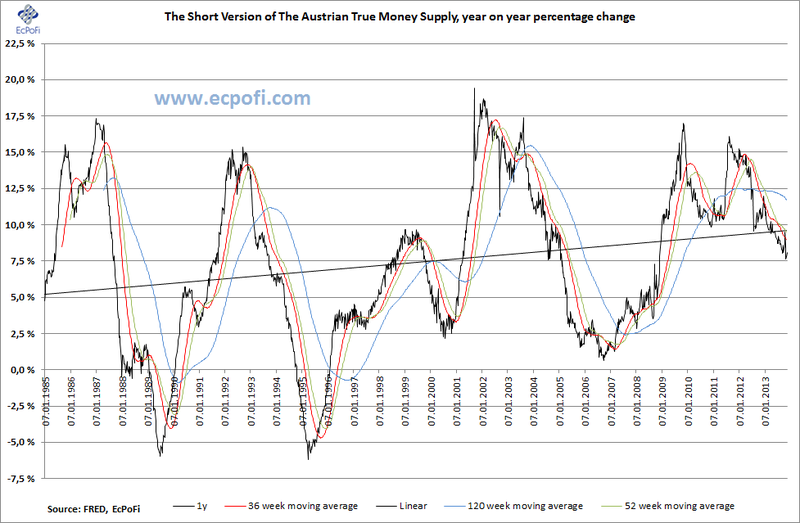 In fact, the circulation credit theory of the business cycle [also called the Austrian Theory of the Business Cycle] explains the theoretical microeconomic factors which determine that the attempt to force a more capital-intensive productive structure, without the corresponding backing of voluntary saving, is condemned to failure and will invariably reverse, provoking economic crises and recessions. Back to my point on shorter boom and bust cycles. A casual inspection of the 5-year annualised growth rate in the money supply reveals the underlying reason for the boom bust cycles during the last 20 years or so. The chart below might indicate we are reaching the end of yet another boom cycle, created by an expanding growth rate in the money supply. The black line in the chart depicts the percentage point change in the 5-year growth rate in the money supply. It peaked around September time back in 2011 and has since been heading downwards. 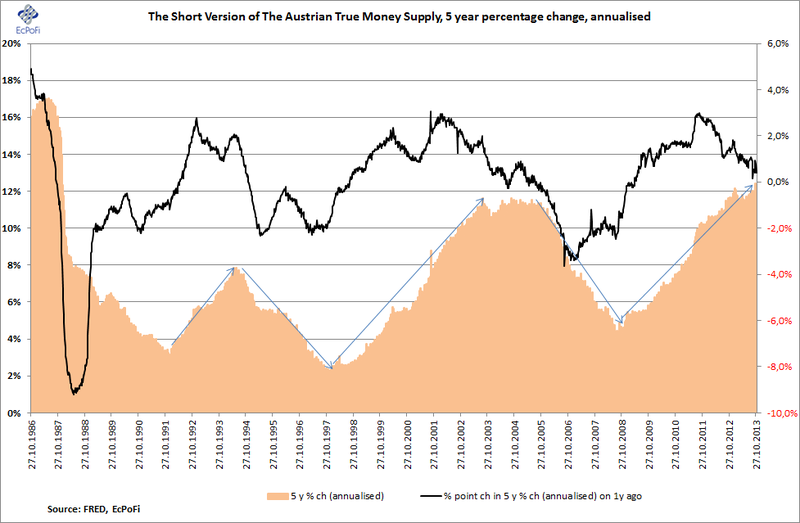 This might suggest the 5-year growth rate in the money supply, depicted by the bars in the chart, has either already peaked or is close to peaking. If that indeed proves to be the case, the U.S. might now be heading for yet another bust cycle and bring other economies down with it.